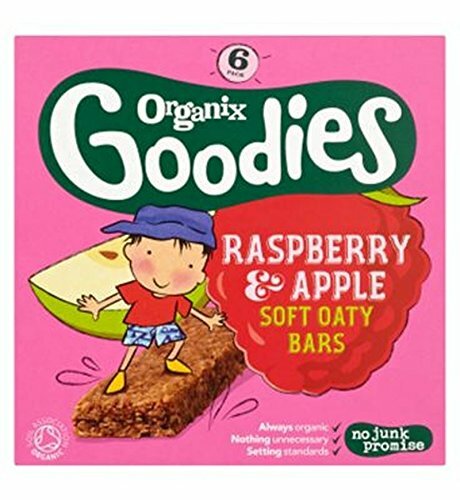 Organix Goodies Organic Raspberry & Apple Soft Oaty Bars 6 x 30g Organic apple & raspberry soft oaty bars containing a blend of organic wholegrain oats, raisins, apple and raspberry juice. All toddlers love snacks but snacks don't have to be naughty. Thanks to our No Junk Promise our Goodies Organic Raspberry & Apple Soft Oaty Bars are packed with the goodness of wholegrain oats. What's more we only use organic fruit juice concentrate and no added processed sugar. Features Organic No junk promise Wholegrain - more vitamins, minerals & fibre No added sugar - contains only naturally occurring sugars No hydrogenated fat No artificial colours or flavours Suitable for vegetarians Country of origin - United Kingdom Name and address of manufacturer - Organix Brands Ltd., Dorset, BH2 5LT. How to Use Storage Keeping them great! Store in a cool dry place. Hazards and Cautions Not suitable for children under 12 months. When feeding a child please ensure that they are sitting down and supervised to reduce the risk of choking. While every care has been taken to ensure this information is always as accurate as possible, food products are regularly improved and nutrition content may occasionally change. As a result we recommend that you always read the label carefully before using or consuming any products. Nutritional Reference Value (NRV) information is based on the typical composition of the product. Guideline daily amounts are those for a typical adult (men and women). NRV information for non Boots products is calculated by the manufacturer. Boots has no control over the recipe or nutritional content of such products and information on this site may differ to that given on the product label. We would therefore recommend you do not solely rely on this information and always read the product label.